The Quality Inn hotel is located close to several shops, golf courses and restaurants. Nearby area attractions include Five Flags Speedway, Pensacola Interstate Fairgrounds, Pensacola Regional Airport and Pensacola Junior College. The National Naval Aviation Museum, the University of West Florida and the Escambia County Equestrian Center are also close to the hotel. Pensacola beaches are only 15 miles away. In addition to standard amenities, all spacious guest rooms include microwaves, refrigerators, coffee makers, safes, hair dryers, irons, ironing boards and 32-inch LCD televisions. Non-smoking rooms are also available. Guest laundry facilities are located on the property. Full-service amenities and features include: Free high-speed Internet access; Free USA Today; Free local calls; Free coffee in the lobby. Business travelers will appreciate modern conveniences like voice mail, a business center and access to copy and fax services. Enjoy our free hot breakfast featuring eggs, meat, yogurt, fresh fruit, cereal and more, including your choice of hot waffle flavors! Guests of this Pensacola, FL hotel will also enjoy the seasonal outdoor pool and exercise room. Sam's Fun City amusement park and Sam's Surf city water park are also close to the hotel. Visitors will enjoy shopping at the nearby Cordova Mall or visiting Seville Square park. 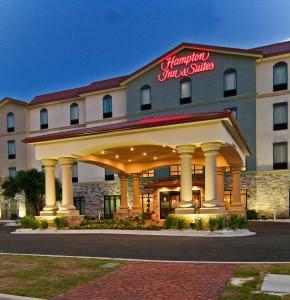 This Pensacola, FL hotel is conveniently located close to medical centers, universities, downtown entertainment and sporting events. Local restaurants and cocktail lounges include Cracker Barrel Old Country Store restaurant, Denny's, the Waffle House, Chili's Grill & Bar, Ruby Tuesday, Coach-N-Four Steakhouse, Finnegans Wake Irish Pub & Eatery and Tickets Sports Bar. When would you like to stay at Quality Inn Pensacola ? This room features a 32-inch flat-screen cable TV as well as a microwave and refrigerator. Each day we'll check prices and send you an email for your selected dates at Quality Inn Pensacola. If you don't have specific dates but would like to check prices for say next weekend or say next month we can check the price too. Click to write a review and share your experience of Quality Inn Pensacola with other travellers.